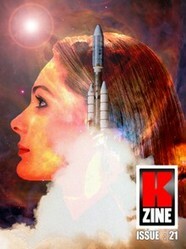 The May 2018 issue of the Kindle and print-on-demand science-fiction, fantasy, crime and horror magazine KZine contains six original stories by Lars H Hoffmann, Anne E Johnson, Matthew Lyons, Jamie McNabb, George Sandison and JH Zech. The cover art was by Dave Windett and the magazine was edited by Graeme Hurry. There are six short stories in the May 2018 (Issue 21) issue of KZine, a science-fiction, fantasy, crime and horror magazine for the Kindle. The editor this time keeps the best till last with the gory horror story from Matthew Lyons. Jamie McNabb’s crime and drugs story also stands out and Anne E Johnson adds some humour to the proceedings. Jenna needs to find ingredients for a spell to bring her parents into the country. Her friend Simon works in logistics and can help, but he is worried about the strange cube that appeared outside his house. A tale that combines magic, horror and mystery with a bit of paranoia. An interesting start to the issue. The poet had to convince a ship full of mechanical devices of his worth. Even though his output over the years was impressive, he hadn’t produced a single poem in the past eight months. The Mechan captain gave him one more day to write one, but another spaceship had other ideas. What seems like a straightforward but entertaining story has a nice unexpected twist at the end. Mike’s “date” with a prostitute down by the canal did not go as planned – after all, being eaten by a giant worm was not in her list of services. The police, of course, didn’t believe her, apart from one officer who recalled a story she was told as a child. A mix of horror and mild humour, at least I hope the humour was intentional. Amused. It was Lyn’s first day at the all-girls school, but she felt an outsider being the only commoner in the class, and she’d already upset a member of the royal family. The teacher seemed nice; she was human. The pupils were all tigers. But this is really a detective story with a pile of politics to cloud the issues. An intriguing snippet that felt like part of a larger story. Maybe there is more to come. Harry Overton, 75 years old, reminisces in a seaside café. But his thoughts were of a darker time, a time he had committed murder. It was all connected with drug dealing, and all done with the knowledge of the local police. These days, pot was legal, but there will still rules to be tested or ignored. Could history repeat itself? This calmly told tale of drugs and murder shines because of its matter-of-factness. Randy is not enjoying the PTA meeting, especially as there are no teachers, just full-of-themselves parents. So, he decides to spike their drinks with a new drug his dealer asked him to test. It is fun to watch at first, lots of uncontrolled giggling and two women getting off with each other, then one of the parents spoils it by killing one of the others, and it all goes wrong very quickly. This is good, gory horror that fans of zombie movies will love. As usual, the issue contains a section giving brief biographies of the authors. The magazine was edited by Graeme Hurry and the cover art was by Dave Windett. And it is available from Amazon as a print-on-demand magazine for those that do not like reading from a tablet. Contenders for the title of best science-fiction novel of all time.